MARINA DEL REY — Since April, the 2,095-ton derrick barge Paula Lee has been working at Marina del Rey’s harbor entrance, removing thousands of cubic yards of sediment from the channel and placing it in barges for disposal at the Port of Long Beach’s authorized fill site. The $13 million project has helped establish a deeper and safer channel for boats entering and exiting the harbor, and it has also removed contaminated sediment from the area that was unsuitable for ocean disposal or beach replenishment. Of the 1 million cubic yards scheduled for removal, 500,000 cubic yards tested unsuitable for ocean disposal — and after four months, that material has been cleared out of the area. With the contaminated sediment removed, the project will move toward removing the clean sediment, using the sand to replenish many of the area’s depleted beaches. In July, more than 140,000 cubic yards of sand was delivered to Playa del Rey’s Dockweiler State Beach. And beginning Aug. 9, Paula Lee began dredging clean sand to be used for Redondo Beach. The 40-day project will be moving approximately 160,000 cubic yards of sediment from Marina del Rey’s north entrance and barging it to an offshore location southwest of the Topaz jetty, at a depth of 30 to 50 feet. “That’s a natural depression that will store the material for future replenishment projects,” said Cesar Espinosa of the Los Angeles County Department of Beaches and Harbors, the dredging project’s organizer. The area acts as a natural pit, holding sand that will later be placed on the beach. The process will require an excavator to fill a barge anchored about 1,000 feet offshore, and then pumping the sand onto the beach via an underwater plastic pipe. More than 2,000 cubic yards of material can be distributed on shore with this process. After the sand is delivered to the beach, bulldozers can then spread the sand to evenly distribute it. There, darker harbor sediment can dry and be bleached by the sun. The beach area targeted first is between Topaz jetty and Ruby Street. Over the years the amount of beach area has greatly deteriorated. About 75,000 cubic yards is scheduled to be placed along the coastline. In 1999, around the time of the last harbor entrance sediment removal project, Topaz Beach measured approximately 180 feet, from the water’s edge to the bike path. It is about half as wide today, with some areas measuring less than 60 feet wide. 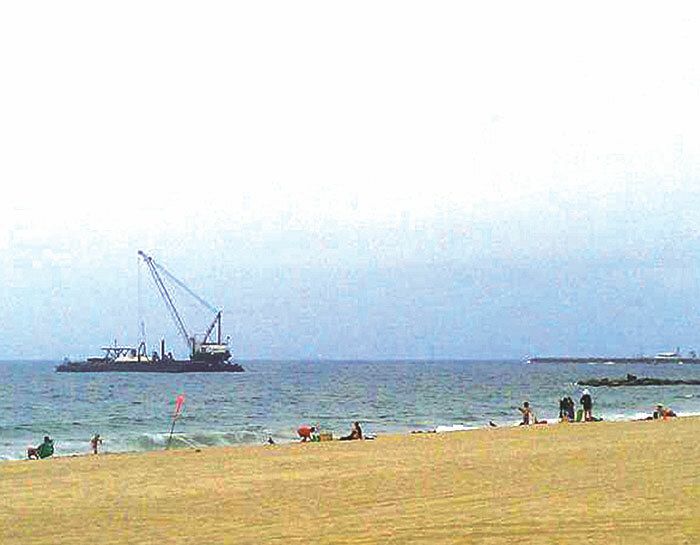 While the sand replenishment is a benefit to local beach-goers, the harbor entrance channel deepening project’s main goal is to help improve navigability for first responders such as Coast Guard vessels, Baywatch lifeguard boats and Los Angeles County Sheriff’s Marina del Rey Marine Patrol vessels, which are often hindered by shoaling at Marina del Rey’s north and south entrances. Depending on tides, larger vessels entering or exiting the harbor are often limited to the channel’s north entrance, as sediment buildup over the years has continued to impair harbor navigability. Los Angeles County Lifeguards receive numerous calls each year reporting vessels running aground at the Marina del Rey harbor entrance, which was last dredged in 1999. Since then, more than 1 million cubic yards of sediment from the surrounding beaches and Ballona Creek has settled around the channel entrance, making many recreational boaters’ trips in and out of the harbor a stressful activity. The cost of the project has been divided between the county and the Army Corps of Engineers, with the county paying $5.3 million and the Corps of Engineers contributing $7.7 million.